The Hoya Hoya label stirs from its slumber with two follow ups to its March release from James T Cotton aka Dabrye. HOYA005 comes from long time Hoya affiliate/punter/performer Blue Daisy (whose Unknown Shapes moniker saw some early exposure on Groovement) and is on an epicshit tip (also see this for more on this genre), chronicling the story of an emperor’s life made in six parts over six hours. HOYA006 sees Altered Natives’s debut release on the label following his recent set at the club in January. Blue Daisy – An Emperor’s Tale is out 7 September on tape then digitally 16 September. 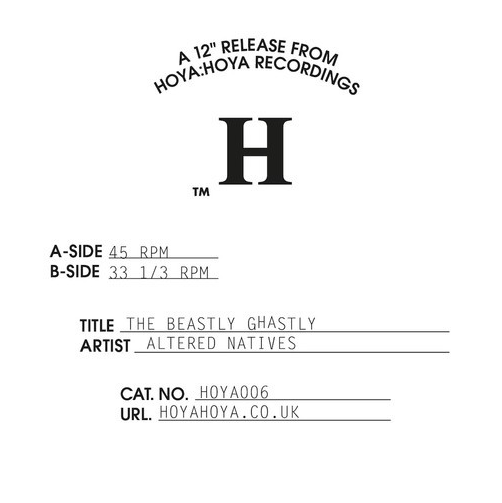 Altered Natives – The Beastly Ghastly is out 9 September on 12″ then digitally 16 September also.